People are always asking me what my favorite show/performer/artist is or was. It’s a good question, as I’ve seen just about everyone (no, I won’t drop names) since I started going to concerts in 1964…and have been privileged to photograph so many world class musicians since 1971 or so. Of course, the question and answer are totally subjective. So much comes into play; venue. mood or state of mind of the viewer, how good the artist was that particular show, and the incredible momentary fleeting nature of That Particular Moment… In that context, and framing, let me introduce Leonard Cohen. Leonard Cohen’s show on Season 14 (out of 30) was one of my 5 all time favorite shows, and my all time favorite ACL from 26 years of covering that particular gig. 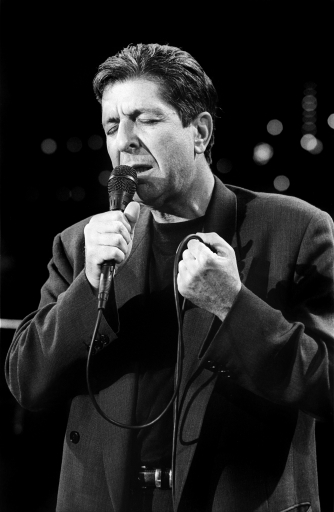 And to make it extra special, Leonard hisownself saw this photo and made it the cover of his Leonard Cohen Live album. He’s stopped touring now, but if he ever starts up again, don’t miss Leonard. He does more, with practically no singing voice, than anyone I’ve ever heard. He’s World Class. See for yourself, if you get the chance.